The Natural Sleep Store offers a variety of 100% organic cotton blankets in light to heavy weight. 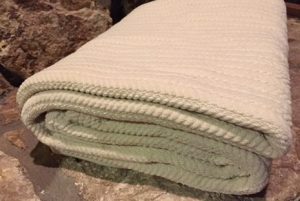 Expertly crafted, the Organics And More Organic Cotton Chenille blanket has hemmed edges and is designed to fit your bed. The attractive herringbone pattern provides texture and warmth to this mid-weight blanket. The organic cotton is never dyed or treated and is a pleasing ivory color. We love this organic blanket because it’s machine washable, but the best part? It gets softer and softer after every wash. Cozy yet durable, The Organic Cotton Chenille Blanket is a healthy, delightful alternative to conventional cotton blankets. 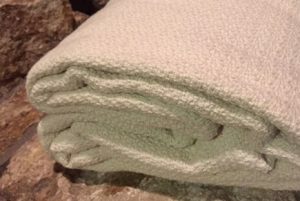 Made in the U.S.A. from GOTS certified organic cotton yarns grown in the U.S.A.
$52.00 – $172.00 Medium weight blanket. Gets softer after every wash! The Under the Nile Organic Cotton Blanket is a customer favorite. It is a brushed cotton blanket made from the finest 100% organic Egyptian cotton and edged with a 100% organic twill fabric. 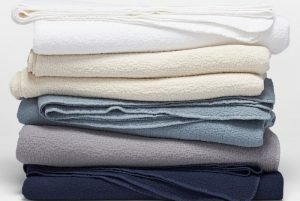 Undeniably soft, this heavy weight blanket is the perfect bedding addition, especially during those arctic winter months. 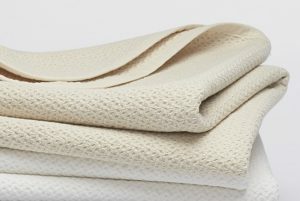 Under the Nile blanket comes in a natural, unbleached ivory color and is machine washable. $160.00 – $290.00 Brushed Organic Egyptian cotton blanket. Great for colder weather. Fall in love with the Organic Cotton Chenille Stripe blanket from Organics and More! The attractive stripe pattern makes this super-soft mid-weight blanket a favorite for cooler seasons. The organic cotton is never dyed or treated and is a pleasing ivory color. Super cozy yet durable, the Organic Cotton Chenille Stripe Blanket is a healthy, delightful alternative to conventional cotton blankets. Machine washable. Made in the U.S.A. from GOTS certified organic cotton yarns grown in the U.S.A.
$53.00 – $172.00 Soft chenille blanket with a gorgeous stripe pattern. 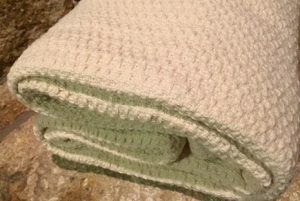 The Organic Waffle Weave Blanket is a soft, lighter weight blanket that can be used year round. The loose waffle weave allows for more flexibility and comfort than a tightly woven blanket. This blanket is cozy, and pretty enough to leave out as a throw for chilly evenings or afternoon naps! Its hemmed edges give the blanket a nice finish, and the undyed, untreated natural ivory color compliments almost any decor. The Organic Waffle Weave Blanket is made in the USA from start to finish, using GOTS certified organic cotton yarns, and it’s machine washable! $40.00 – $131.00 Medium weight blanket for extra warmth and comfort. 100% organic cotton. Crafted in Portugal from exceptionally fine organic cotton yarns, this matelassé blanket pairs a light, lofty feel with an allover stitched texture inspired by quilted kantha cloth. 100% organic cotton is sourced from India and woven in Portugal. Stonewashing gives the fabric its soft and plush, pleasingly rumpled hand. The blanket is offered in a range of solid colors and finished with a simple bound edge, for endless versatility and effortless layering. 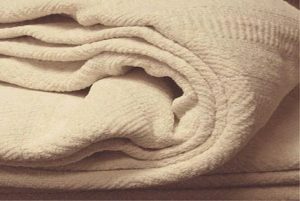 Safe to machine wash.
$298.00 – $348.00 A 100% organic cotton light textured blanket crafted in Portugal. The Coyuchi Cozy Cotton blanket pairs the plush touch of chenille with the lightweight warmth of organic cotton. Stonewashing gives this blanket a delicate puckered texture. Each color reverses to white, offering two ways to decorate. The Coyuchi Cozy Cotton Blanket is made from 100% organic cotton, sourced in Turkey and woven in Germany. It is safe to machine wash (please see washing instructions). Welcome to comfort. The Coyuchi Honeycomb Blanket is a heavy weight blanket that is perfect for cool summer nights. The chunky weave and organic texture gives it warmth that is great for layering when the weather turns cold. Available in a number of subtle, attractive colors that compliment a multitude of bedding styles, or look great simply draped over a chair or sofa. The Coyuchi Honeycomb Blanket is made from 100% organic cotton, sourced and woven in India, and safe to machine wash. Edges are expertly finished in matching organic cotton percale. $144.00 – $233.00 A 100% organic cotton heavy weight blanket. You can’t go wrong with any of these amazing organic blankets! They are all made from 100% certified organic cotton. Sizes Throw, Twin, Queen, and King. The Waffle Weave is a lighter weight organic blanket, perfect for year-round use. Natural color, USA grown and made. The Crepe weave is in between light weight and medium weight. Great as an extra layer in winter and for those cooler summer nights. The Chenille Stripe blanket is a medium weight blanket with a very soft feel. Natural Color and USA grown. The Under The Nile blanket is a customer favorite! It is a medium weight blanket, but very warm, cozy, and soft to the touch. Coyuchi’s honeycomb weave blanket is a heavier blanket tightly woven into a stiffer blanket. 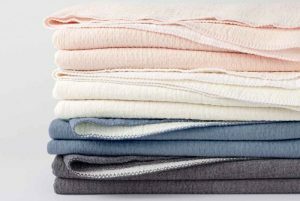 All of these organic blankets are machine washable and last for years and years!